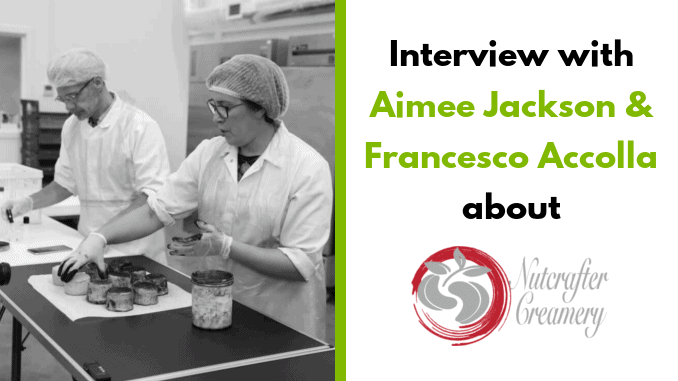 Nutcrafter Creamery was founded by Francesco Accolla and Aimee Jackson, both long term vegans with a composite professional background ranging from classical music composition to psychology, always in deep love for authentic food, cooking and the bonding of cultural process that springs from preparing and sharing a meal together. The couple, who hail from Pittsburgh, USA and Rome, moved to the west of Scotland together with their two sons in 2013, and in 2015 started to operate Nutcrafter from a miniscule space in south-side Glasgow. Three years and two space upgrades later, they now live in Port Glasgow, within walking distance of their new, state-of-the-art premises where they employ four people. Before moving to Scotland, the couple managed a vegan café in Rome where, unsatisfied with the highly processed, unhealthy, inedible products, they started to experiment with cashews and cheese making including curdling, fermentation and ageing. Can you tell us a little regarding current portfolio and distribution? Nutcrafter Creamery currently sports 16 products including nine flavours of air-aged cheese, 4 flavours of cream cheese spread, Nutzarella (our mozzarella style), Bettah than Buttah, (a buttery spread), Vhalloumi (our halloumi style) and Parmavegan (grated parmigiano replacement). All our products are made with organic ingredients. Some are already certified, and the vast majority will follow in the next few months. Fermented cashew nuts are the main ingredients of all our products except for Parmavegan (almond based). Currently all our products are made and packaged by hand in small batches. What is Nutcrafter’s Unique Selling Point? 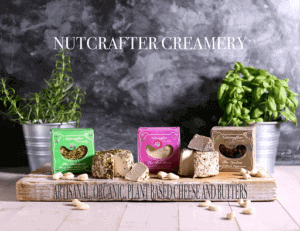 Nutcrafter Creamery has already carved out a reputation as one of the most respected brands of natural, plant-based food and as the only UK-based certified organic producing a product of its kind. Where are your cheeses currently available and do you have plans to expand into other markets? Currently our products are available in over 80 stockists nationwide plus a range of stores in France, Belgium, The Netherlands and New Zealand. We are distributed in UK by Suma Wholefoods (which also distribute us in mainland Europe), The Health Store and Greencity Wholefoods. In addition, in France we are distributed by Un Monde Vegan and in New Zealand by NZ Soy Essential. As of now, we are actively seeking to expand further in mainland Europe, in Australia and United States. Upcoming products include a line of ready-made sauce (Nacho, Ajioli and Cheddah), a line of frozen, ready-to-eat products based on our cheeses and a stand-alone egg replacer. Are you currently seeking investors? Growth is paramount to the success of any business and at this stage we welcome investors interested in taking on a bigger role to help turn our business into a scalable model as well as provide the funding sources to make it happen. Please comment on your recent expansion, and what changes have occurred in your company since. Nutcrafter Creamery has just moved its operations to Kelburn Business Park, Port Glasgow, a state-of-the art new manufacturing facility. We now have time to plan and grow. Our expertise, ambition and exciting vision will hopefully allow us pursue global expansion through horizontal growth and scalability. Which are your most popular products and why? Within our flagship aged cheeses products, we have our 2017 PETA-Award winner “Ancient Cheddah”, the “Out of the Blue”, a true aged blue cheese and the “Piquant Chipotle”, an assertive unique cheese with a measured punch and after taste. Top sellers are also our Bettah than Buttah, the only palm oil free vegan buttery spread on the market, full of true nutrients and probiotics and last but not least, our ubiquitous Vhalloumi, a cashew-based cheese that has gained a wide social and critical acclaim for resembling and surpassing the dairy counterpart. What are your future plans and how do you imagine Nutcrafter in five years? Nutcrafter Creamery fosters food that has an imagination and a story; food that helps form respect for all earthlings, awareness for the planet and consciousness for our future generations. Our goal in time is to remain focused on the vision and ethos that made us start in the first place. Historically, people have eaten for a great many reasons other than biological necessity. Food, in our own vision, is about pleasure, community, family and spirituality. Food is a powerful medium that shapes our viewpoint in health and wellness, engrave our relationship to the natural world and guide us to express our identity. We want to foster and fortify our vision through our products and our actions. Starting with next Veganuary, we will be offering in our facility, in conjunction with our local Council, a plant-based food cooking class aimed especially at children and young adults from low-income families, categories especially vulnerable and historically targeted by the food conglomerates representing intensive farming and global, ruthless agribusiness.